With Pennsylvania’s strategic location in the heart of the East Coast, nationally ranked educational institutions, and a workforce equipped to support future growth — we think Pennsylvania is a great place to do business. 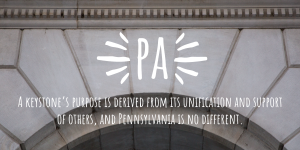 You’ve likely heard our state nickname is the “Keystone State,” but if you weren’t Pennsylvania-born or raised, you may not know how we earned that moniker or the role it plays in our identity. During the founding of the United States, Pennsylvania not only provided the foundational keystone for our nation’s new, revolutionary democracy, but also served as the ideological compass for our American values of freedom, innovation, and tolerance. No other state is home to as many “firsts” as Pennsylvania can claim. In addition to the Declaration of Independence and the U.S. Constitution, we are the birthplace of the first hospital, first university, first stock exchange, and more. Today, Pennsylvania continues to lead the way for successful businesses and communities with innovation, imagination, and our legendary can-do spirit. Our location at the geographical center of the East Coast, rich cultural heritage, abundant natural resources, and job-ready workforce has made us a hub for commerce and a leader in technological innovation and education. We’ve been here since before our country’s founding, and we’re equipped to support and sustain business for centuries to come. 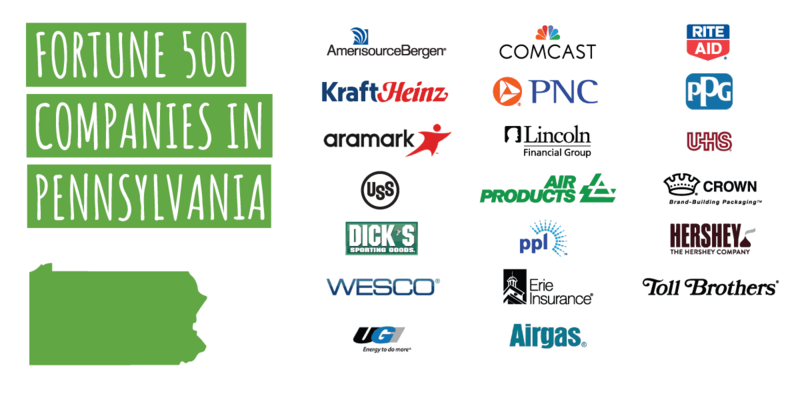 Pennsylvania helped build America, and we continue to inspire companies and communities in their pursuit of happiness. We know companies aren’t confined by borders, and neither are we. Pennsylvania provides easy access to top assets within our own borders and those of our neighbors too. With just an easy drive, quick train trip, and an even shorter direct flight, we’re halfway between the U.S. financial and regulatory hubs of New York City and Washington, DC. Being well-connected and having the lowest cost of living in the Northeast U.S. — that’s something we think everyone can appreciate. Nearly 40 percent of the U.S. population and 60 percent of the Canadian population (U.S. Census , Statistics Canada ). Four of the 10 largest U.S. markets (BEA ). Nearly 40 percent of all U.S. manufacturers. 26.5 minutes average commute (U.S. Census ). Only state with port access to the Atlantic Ocean (Philadelphia), Gulf of Mexico (Pittsburgh), and Great Lakes (Erie). Eight airports with flights to Seattle. Our workforce is characterized by a special combination of education, experience, and our legendary can-do spirit — resulting in new innovations and technologies. It’s in our DNA. Pennsylvania workers built this nation, and that spirit and drive — along with our state’s founding principles of openness and tolerance — continues to push our workforce to new heights. Ranks in top 15 states for technology and innovation (CNBC ). 8th largest tech employment in the U.S. (CompTIA PDF). Ranks in top 10 states for STEM jobs (Business Facilities ). Nearly 240,700 tech jobs, with an average annual wage of $98,340. 5th largest number of STEM graduates in the U.S. (Site Selection Group ). Four top-ranked universities granting the most STEM degrees as a percentage of all degrees (U.S. News ). Five of the 56 U.S. STEM Learning Ecosystems . 24 percent of degrees awarded from state-owned universities are STEM-H.
37 percent increase in the number of STEM-H graduates from public four-year universities since 2009. Two cities rank in the 25 top startup cities, Philadelphia (3) and Pittsburgh (12) (U.S. Chamber of Commerce Foundation, et al. PDF). 8th nationally for number of venture capital-assisted companies (NVCA ). $5 billion invested with 822 PA startups by venture capital firms between 2012 and 2016. From corporate headquarters to manufacturing facilities to state-of-the-art R&D labs, Pennsylvania has the full spectrum. Our economy is also globally competitive, and our economic density, diversity, and localization provide cost-effective access to critical supply chains. $719 billion GDP (BEA ). 19th largest economy in the world (BEA , World Bank ). GDP that’s comparable to Turkey and larger than Saudi Arabia and Switzerland. 21 Fortune 500 companies (Fortune ). Three Fortune Global 500 companies (Fortune ). 2nd most diverse state economy (Missouri Economic & Research Center ). Ranks in top 10 states for economic density (GDP per square mile). #1 Northeast state for site selectors (Site Selection Magazine ). Eight foreign trade zones (International Trade Administration ). Supported 139 businesses in relocating to PA from another state over the past five years. Six PA cities rank in top 100 business-friendly U.S. cities (MarketWatch ). 6th nationally in access to capital (CNBC ). Pennsylvania’s infrastructure is comprehensive and internationally connected. With nearly half-a-trillion dollars’ worth of goods and services moving through our state transportation system every year, businesses have confidence that they and their products have the reach they need to be effective. In Pennsylvania we’re also proud of our connections as part of the Northeast corridor, and our direct international ties. $61.9 billion over the next 12 years will be invested in improvements to roads, bridges, transit systems, airports, and railroads. 64 railroads, the highest number of operating railroads in the U.S.
>5,600 railroad track miles, ranking near the top in U.S. in total mileage. >120 daily passenger trains to Northeast corridor and across the state. 5th in direct support of public transit in the U.S. Ranks in top 10 states for the volume of goods moved through our ports. Pennsylvania’s education system produces the workforce that drives our economy. From pre-K through college and graduate programs, some of the strongest schools in the country can be found in the Keystone State. 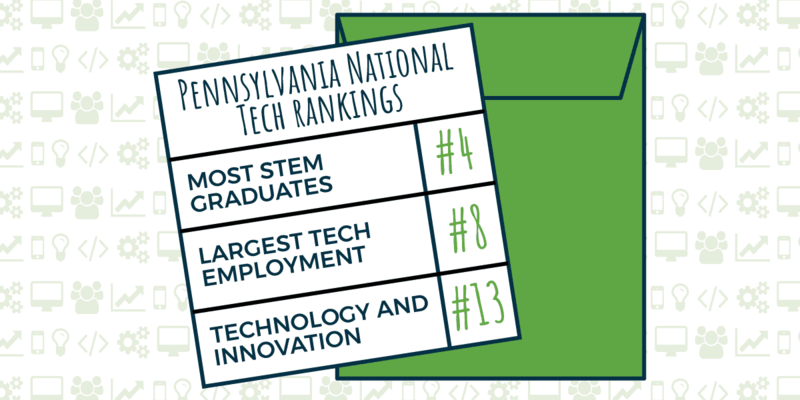 In addition to being a national leader in science, technology, engineering, and mathematics (STEM) education, Pennsylvania has some of the top graduate programs for business and computer engineering. Ranks in top 10 states for education (CNBC , Top States for Business). Seven of the top 100 U.S. universities (U.S. News ). Four of the top 100 global universities (U.S. News ). 11 of the top 100 U.S. liberal arts colleges (U.S. News ). Pennsylvania State University (Penn State) has the largest alumni network in the U.S.
Best computer science graduate program, Carnegie Mellon University (U.S. News ). Best business graduate program, Wharton Business School (U.S. News ). Best public university in the Northeast, University of Pittsburgh (Wall Street Journal ). 5th nationally in the number of STEM graduates (Site Selection Group ). In Pennsylvania we also value our early education and K-12 education system: Making sure our youngest students receive a world-class education is vital to their — and our — future success. 48% increase in pre-K enrollment in past two years. >$840 million in new dollars invested in K-12 education in the past two years. #2 K-12 school district in the U.S., with four PA districts ranked top 20 (Niche ). Recognized as a promising state by the Obama White House through its Computer Science for All (CSforAll) work. In Pennsylvania, our business assets go hand-in-hand with our quality of life advantages . We have all of the essentials — the lowest cost of living in the Northeast U.S., affordable real estate, prominent world-ranked universities, fulfilling careers, and top-ranked health institutions. Our state boasts an ideal blend of thriving cities, walkable urbanscapes, and charming small towns — with plenty of rugged woodlands and lush countryside to explore off the beaten path. We also take pride in our rich history. As the birthplace of our nation, Pennsylvania was founded centuries ago on the idea that all are welcome and can practice their faith and culture as they see fit. We still live by that grand idea today because ours continues to be an open and welcoming state. Lowest cost of living in the Northeast U.S. Median home price is $161,800 versus the U.S. average of $201,900 (Zillow ). 26.3 minutes average commute (U.S. Census ). 2nd lowest marginal personal income tax rate among states that levy the tax. Three of the top 20 hospitals in the U.S. (U.S. News ). Three of the top 10 cities for millennials are in PA (Trulia ). 121 state parks that are free to the public. Seven professional sports teams with 20+ championships.